Usually when imbibing your favorite craft beer, you are drinking a combination of 4 ingredients: water, malted barley, hops and yeast (if drinking Budweiser add some rice and if drinking Coors or Miller add some corn). Of these 4 ingredients, barley leads the pack in importance as barley gives beer its color, underlying flavor, sweetness, body, head of foam and mouthfeel. 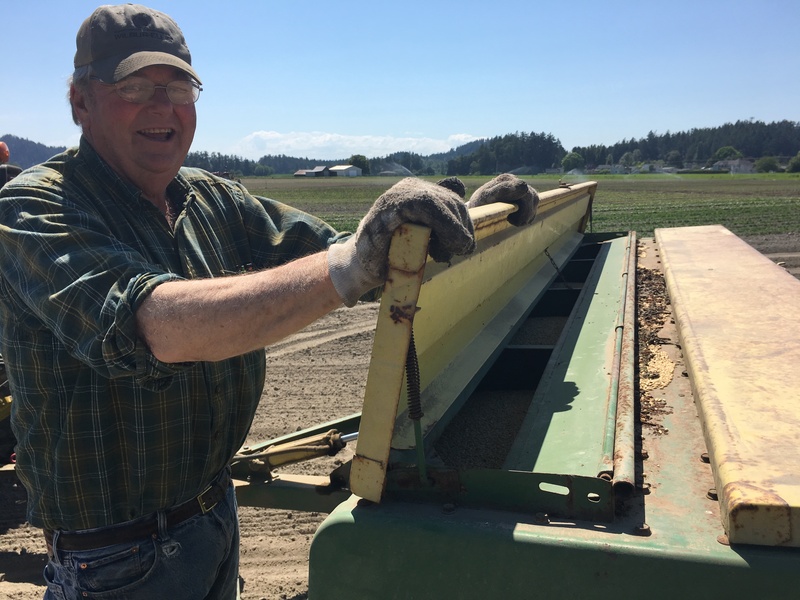 I had the opportunity to ride along with Dave Hedlin, third generation farmer, of Hedlin’s Family Farm in La Conner, WA on his first day of planting organic Skagit Copeland Barley. Hedlin’s farmstand is located at the entrance of La Conner and less than 10 miles from Skagit Valley Malting where the barley will be malted when harvested in late August. Skagit Copeland barley is a two-row spring variety which has distinctive regional flavors. What also makes this barley distinctive is Dave the farmer and the maltsters over at Skagit Valley Malting. Knowing the region where your barley is grown, and recognizing the values of the farmers and maltsters, will only deepen your appreciation for your love of drinking craft beer with Skagit Malts. Skagit Valley’s rich soils are rated by the USDA as among the best in the world. It’s not surprising that the Skagit Valley is starting to get national attention for our craft beer scene given we are home to barley fields, a fast-becoming famous malthouse, a brewing academy, 11 craft breweries, 6 brew fests and an ale trail. You can pick up a Skagit Farm to Pint Ale Trail map and passport at any of the Skagit Valley visitor information centers or breweries. Besides having a great time exploring the Skagit Valley craft beer scene, a free pint glass is waiting for you at your last stop on the Ale Trail. I will be following this beautiful field, surrounded by the Skagit River Delta and the town of La Conner, throughout the summer and joining Dave again at harvest time. Dave carefully watches as he plants the organic Skagit Copeland barley. He only looks up to wave at another farmer, to point out a unique bird (Killdeer) or to smile at the farm workers. “What kind of ice cream would you like?”, Dave shouts out to the farm workers before driving me back to my car. Now that’s the kind of guy I want tending the most important ingredient in my beer!